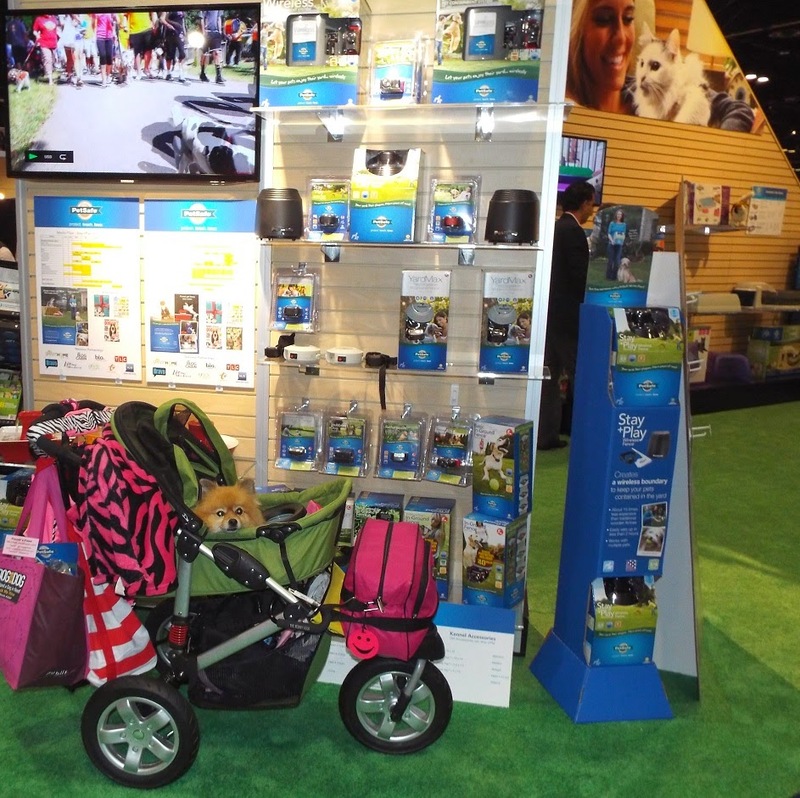 Last week I went exploring at Global Pet Expo 2014. It was even larger this year. There were 4 miles of pet products to sniff. 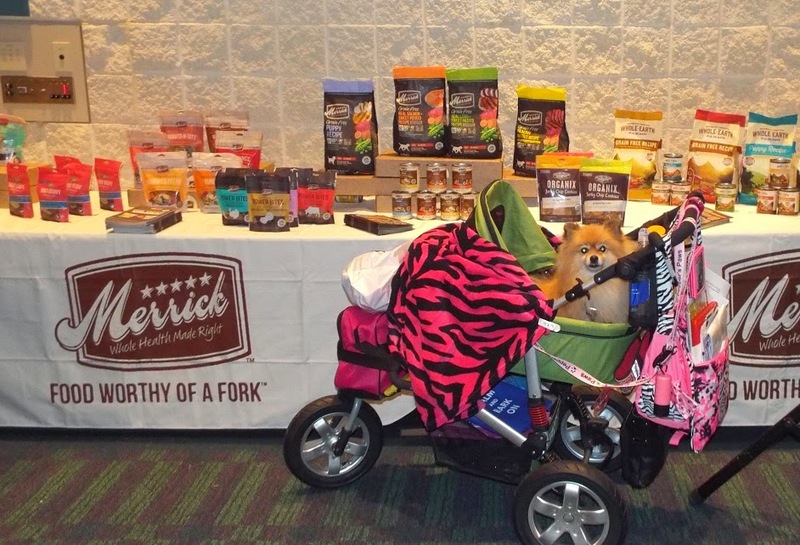 We checked in, picked up our press badge, and attended a breakfast hosted by Merrick Petcare. Anything that starts with treats must be fun. Those treats are all mine, right? We zoomed around the show floor for 3 days. We visited pals we knew and met some new pals. Of course I visited my wonderful pals at PetSafe on the very first day. They have some really fun new products. I'm trying to woof them into making a Pepper Pink fountain for me. That would be so pawsomely special! 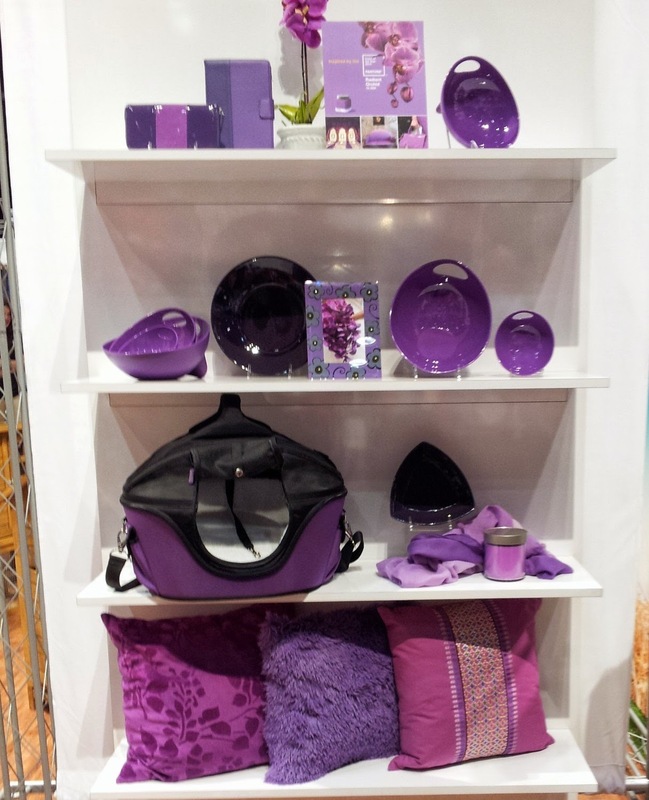 I sniffed out some bright colorful products at the Kyjen booth. 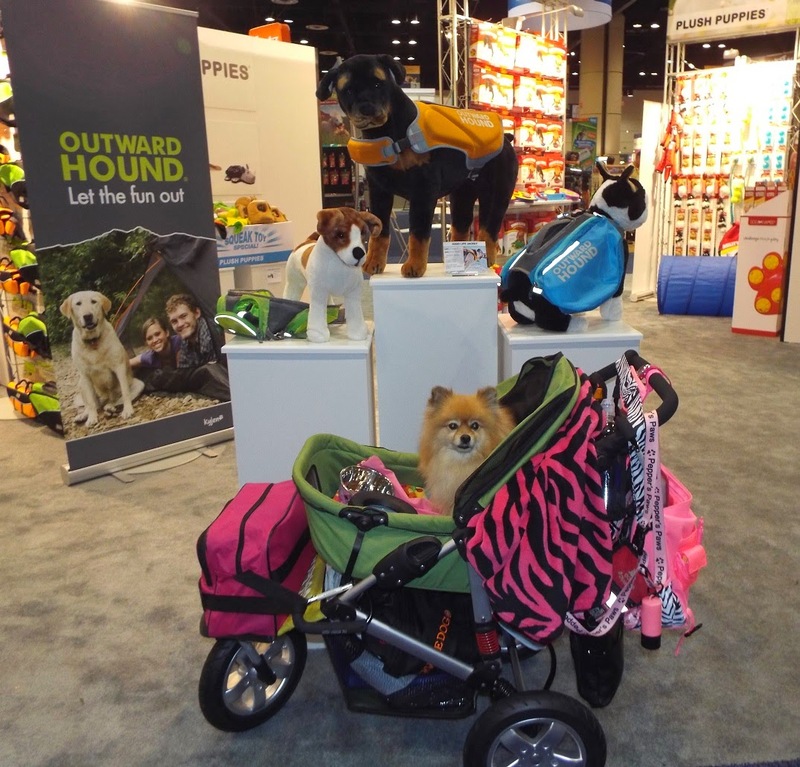 Mom and I were particularly curious about the new products in the Outward Hound line. They are coming out with a new life jacket this summer. Mom wants to check out all the pockets on the new walking belt. They also have some fun looking new slow feeders. Pawsonally, I really hope I get a pink Pet-a-Roo and some Plush Puppies toys! I popped into the Jones Natural Chews booth to bark hello to Ms. Suzy, and sniff all the yummy treats. 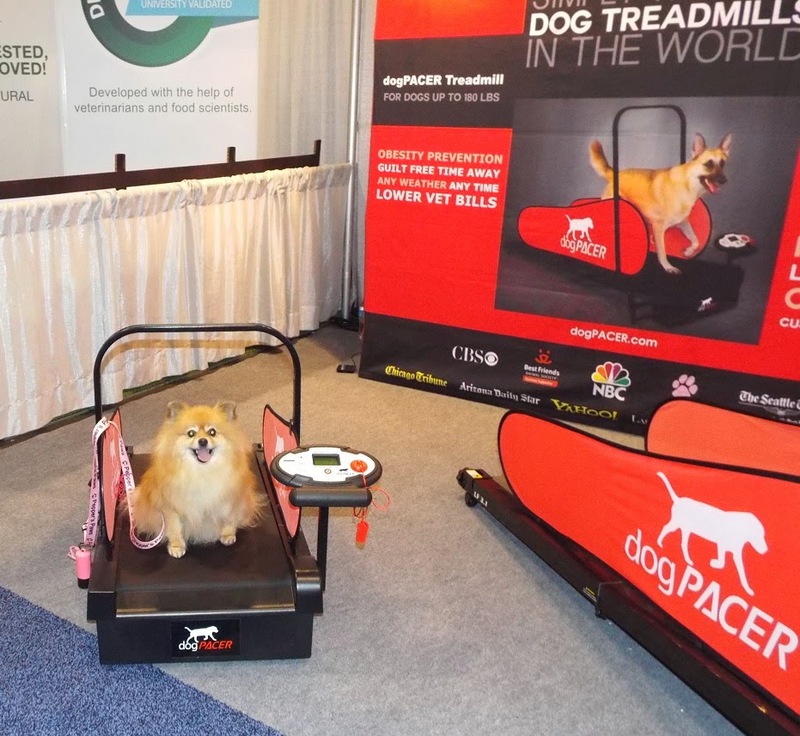 I posed for a photo on the small dog DogPacer treadmill, but I didn't let Mom turn it on. BOL! DogPacer and Sealy Dog Bed were in the same booth. Naturally, I checked out the new Neon bed - it's pink! I want one! I was able to meet a wonderful Twitter pal in furson at the Petmate booth! She showed us that the WetNoz carrier now comes in purple too. She also showed me the new Jackson Galaxy line of kitty toys. Do I sniff a kitty toy giveaway at Pepper's Paws this year? I also met more great pals at Petmate, and they showed me many pawsome new dog items I want to get my paws on! 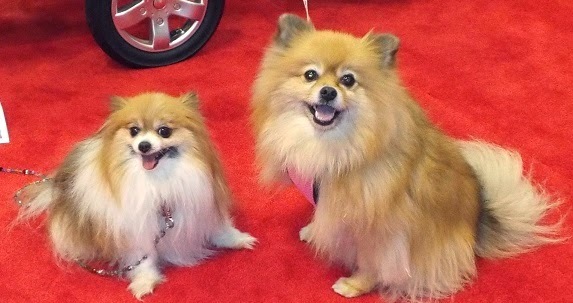 I even met a new Pom pal after the BH Pet Gear fashion show and Calm Coat demonstration. 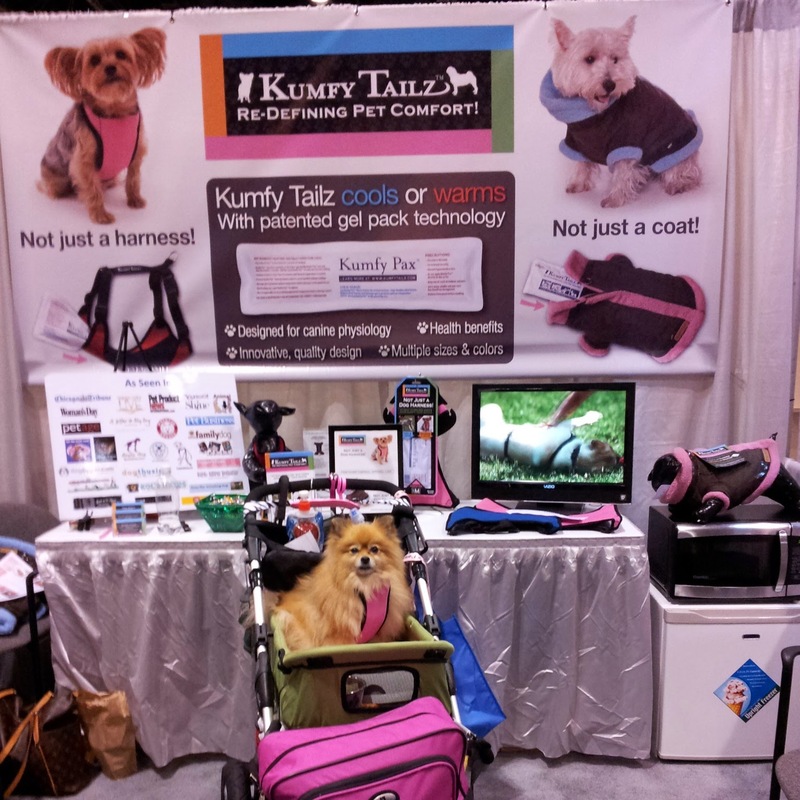 We visited my pals at Kumfy Tailz early in the day. I wasn't completely awake yet, but I did sit up to pose for a photo. 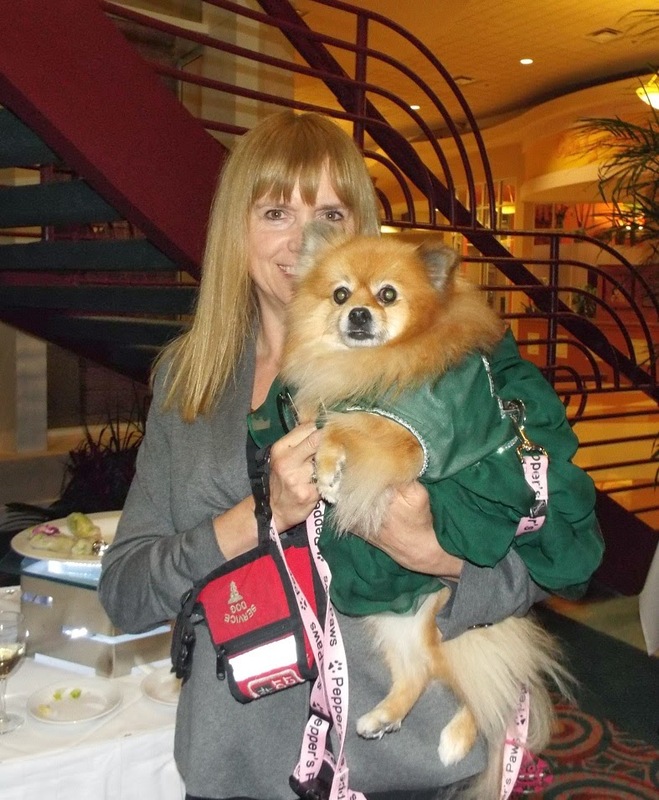 At the Nature's Bits launch pawty, I was able to have my photo taken with Connie from Modern Dog Magazine. Thanks to Pet Monarchy, I was dressed in superb style for the pawties. I will woof more about my beautiful dress next week. 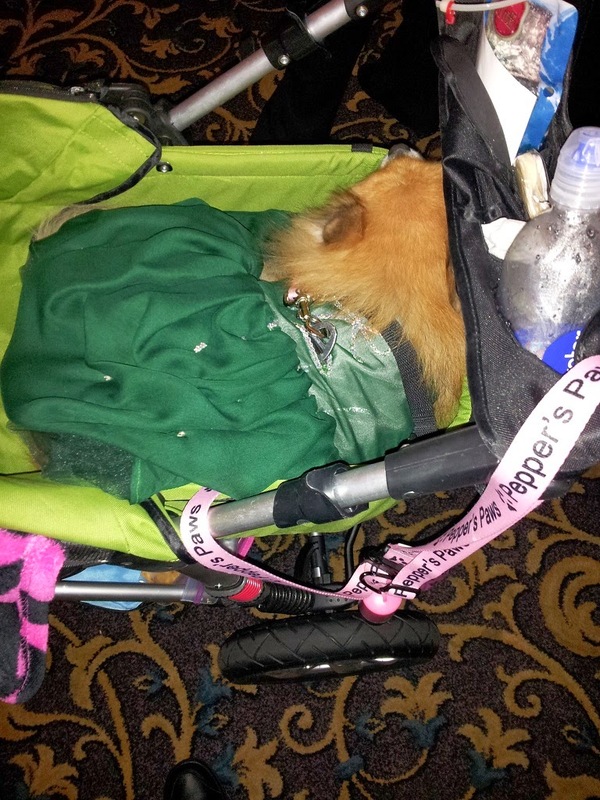 By the end of the show and pawties, I was one tuckered out Pom. Wowf, Pepper, you really got around in your Peppermobile! I wish we had a Pet Expo here! That looks so pawsome! I think my mom wants to go next year. We will see if she can make it. 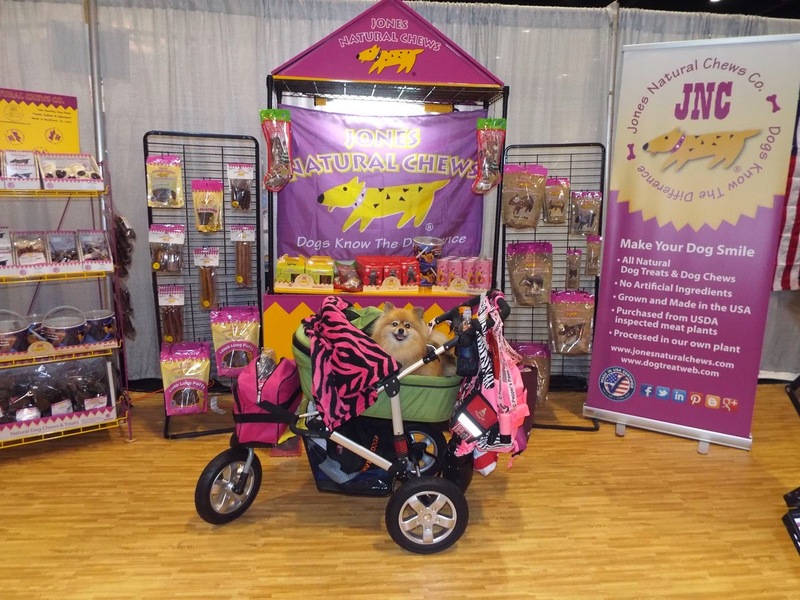 This expo and BlogPaws are all in the spring which is the busiest time of the year for Mom at work, so it is hard for her to get away. I want to go to that next year but you might have to share your stroller with ma. BOL! That looks like some really cool stuff. I am scratching my floof trying to figure out why you didn't shove all that purty purple stuff in your stroller. I may be a big poodle but remember I can become a porta poodle. Ba ha ha ha ha Howls!! Phew! Can't believe we saw soo much! It was great to see you and your mom and I'm really looking forward to see all the great products you two found!